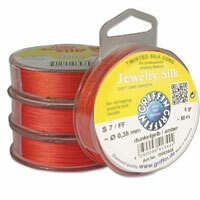 Silk is traditionally the material used for stringing valuable pearls and softer beads, such as coral, amber and jade. It is soft, so it does not damage the pearls or beads. It drapes well. 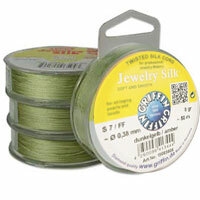 The Griffin Jewelry Silk Bead Cord is made from 100% high-grade filament silk tightly twisted into a 3 ply cord. It is available in 13 colors created to coordinate with gemstones as suggested by the color names. 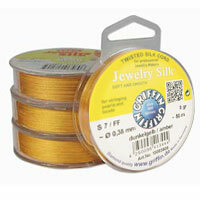 It is a good silk to string beads, for bead crochet or any other projects requiring a strong high quality silk. 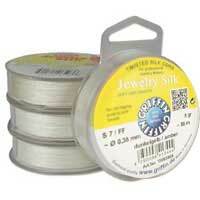 It comes in spools with enough yardage for many projects. 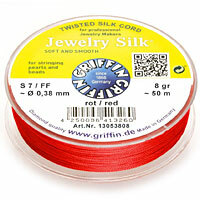 Griffin Jewelry Silk has a very clean profile, no lint, or broken filament sticking out. Yardage vary depending on the cord size. Make a 2-ply cord out of this silk, attach a collapsible needle at its end, and you have the same exact cord offered by Griffin on cards. The Griffin ready made cards only come in length of 79 inches - 2 meters on each card. This is often too short for longer necklaces, crochet neckpieces and other applications, so ply your own in the length you desire with a mini-twister or other twisting methods. Mini-twisters are available in the Tool Section. 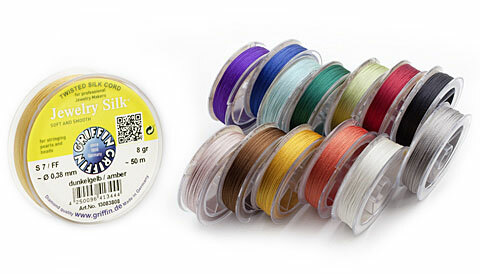 Personal Note - Silk is getting harder to get and it is still the best choice for projects requiring the soft hand of silk. 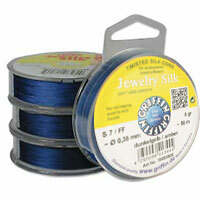 This silk is specifically produced as a bead cord. 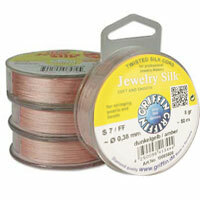 It is very smooth and strong and has just enough colors to work with many gemstones and glass beads. As of March 2016 this silk has been discontinued, I will keep restocking what's available and look for a substitute silk. If ordering large quantities of the same color and size, email for quantities available. Thanks! Note: This item is no longer manufactured. See note above.